Highly efficient and reliable ultraviolet (UV) disinfection systems from Aquionics are improving water purity and air quality standards for swimming and spa pools at the University of Houston in Texas. Since the UV systems were installed, the elite athletes and regular students who use the aquatics facilities have enjoyed health and hygiene benefits including improved air quality and fresher-smelling, clearer and more hygienic water. The University of Houston has a nationally successful women’s swimming and diving team and its alumni include two Olympic diving medalists. The aquatics center stages the annual Western Athletic Conference Championships and has been a training base for the US and Montenegro Olympic water polo teams and the US Paralympic team. For elite athletes such as these it is essential to maintain excellent water and air quality, including the elimination of micro-organisms, to help them produce optimal performances. It is also important to provide spa pool users with a pleasant, relaxing and safe environment that encourages greater use. The university uses chlorine as the primary sanitizer for the treatment of all its pools. However, as part of a major modernization of its swimming and spa facilities - and to ensure that the necessary hygiene standards are not only met but exceeded - the university installed the Aquionics UV Swim ultraviolet water treatment system. Designed specifically for pools, spas and other aquatic applications, these systems use powerful lamps that emit UV radiation to efficiently and effectively eliminate bacteria, viruses, spores and molds. They provide a cost-effective, low-maintenance and environmentally responsible treatment method that produces clearer water, cuts the use of chemicals and creates no hazardous by-products. To cater for the different flow rates of the university’s various pools, Aquionics provided UV Swim disinfection systems in a range of sizes. Most of these systems use a single medium pressure lamp to provide UV light at 200 to 400 nm wavelengths. This breaks down and destroys chloramines that can cause eye and skin irritation, headaches, respiratory complaints, allergic reactions and unpleasant odors. The UV systems installed at the university’s pools are drastically reducing the combined chlorine levels in the water, typically to less than 0.4ppm, and the presence of Cryptosporidium in the water by 99.99 percent. Optimizing water purity in this way also leads to improved air quality, thereby further enhancing the overall experience for all pool users. Using a single medium pressure lamp reduces operating and maintenance costs compared to a multi-lamp low pressure system. The systems operating at the university incorporate a wiping mechanism that automatically cleans the quartz sleeves around the UV lamps, thereby helping to maintain performance and reduce maintenance requirements and costs. The systems provide unique safety features to ensure maximum operator protection when changing a lamp, while a sensor within each system ensures that it will be switched off at high temperatures, further increasing safety. 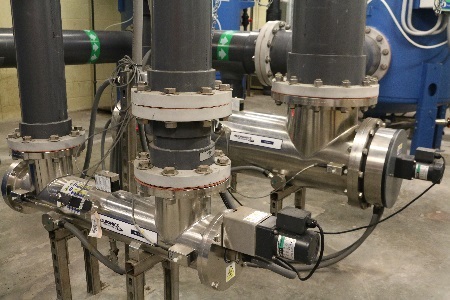 Based in Charlotte, NC and with a national distribution network, Aquionics Inc. specializes in UV technology for water disinfection, dechlorination and deozonation. Working with the biggest names in food, beverage, electronics, pharmaceutical, aquaculture, pools and leisure, the company has gained valuable insights into its customers’ requirements and specialized applications. This enables Aquionics to offer not only the most technologically advanced UV systems, but a complete product portfolio for all markets. The company provides an unrivalled level of customer care under its UVCare service and works very closely with a network of distributors to ensure its customers receive a very professional experience. Aquionics is a Halma company. The University of Houston (UH) is a Carnegie-designated Tier One public research university recognized by The Princeton Review as one of the nation's best colleges for undergraduate education. UH serves the globally competitive Houston and Gulf Coast Region by providing world-class faculty, experiential learning and strategic industry partnerships. Located in the nation’s fourth-largest city, UH serves nearly 41,000 students in the most ethnically and culturally diverse region in the country. For more information, visit www.uh.edu.